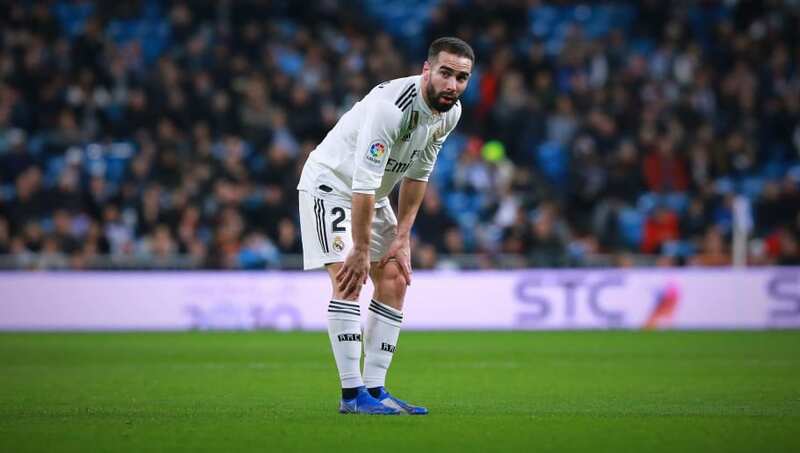 ​Real Madrid defender Dani Carvajal has admitted he would give himself a 'fail' for his performances this season, and described the current situation at the club as 'uncomfortable'. The Spain international has endured a difficult campaign for Los Blancos, with the Santiago Bernabeu side well short of the pace in La Liga and exiting the Champions League at the last 16 stage in embarrassing fashion to Dutch side Ajax. Speaking to MARCA, Carvajal opened up on the struggles of Madrid, and admitted his disappointment at heading into the closing stages of the season without having a trophy to fight for. When asked what grade he would give his own displays this season, the Spaniard said: "I'd give myself a four, a fail. I go with what the group is, and we've not done things well. "It's rare to not fight for any title from March onwards. Just for the pride of the shirt, it's an uncomfortable situation. "I've been a Madridista for many years and when you have nothing to play for in March it seems that things get thrown at everyone and in the end it's logical. There are always players who come and go and even more so if nothing is won." He added: "It was the right one, at the time it was the best thing that could happen to us. We know we don't play the same, he knows our confidence is low and he's brave to take the job now. He knows us all very well, he knows the club and I think he's the most suitable."